Obama: "Trust me. The TPP is good for U.S. workers and the environment, but you citizens can't read any of its text. Have I ever misled you?" "On April 22, 2015, the Senate Finance Committee approved a bill to fast-track the Trans-Pacific Partnership (TPP), a massive trade agreement that would override our republican form of government and hand judicial and legislative authority to a foreign three-person panel of corporate lawyers. It appears that America is no longer a Republic and is already a Plutocracy. This form of government believes a society should be ruled by its wealthiest members. The Supreme Court has allowed a flood of money to buy our elections, rather than the will of the people, income inequality is growing ~ and President Obama is keenly aware of this transfer of wealth and power. 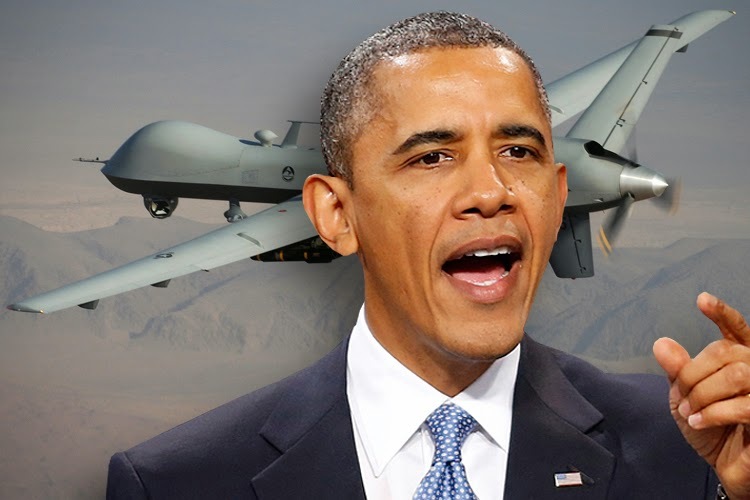 As I have written recently about Obama's enduring Military presence where War equals peace, see article http://www.veteranstoday.com/2015/02/16/obamas-enduring-ground-offensive-war-is-peace/ , the case for targeted drone assassinations becomes mute when we realize that Obama has killed more people with drones than the 3000 who died on 9/11 ~ and many of those killed were civilians, and only a tiny percentage of the dead were al-Qaeda or Taliban leaders. The Council on Foreign Relations estimates that U.S. drone strikes outside of Iraq and Afghanistan have killed 3,674 people. The Bureau of Investigative Journalism reports that up to 4,404 people have been killed – just in Pakistan and Yemen alone ~ between 2004 and 2014. Many of those additional deaths are accomplished through deadly “double taps” … where the family members, friends or neighbors who try to rescue someone hit by a drone missile are themselves targeted for assassination. There can be only one reason for these strikes ~ Fear and Intimidation.
" In recent remarks, you suggested that critics of the TPP are "dishonest" when we claim that the TPP is a "secret" deal. Even though negotiations over the TPP are largely complete, your administration has deemed the text of the agreement classified and kept it hidden from public view, thereby making it a secret deal. As a result of your administrations decision, it is currently illegal for the press, experts, advocates, or the general public to review the text of this agreement. And while you note that Members of Congress may "walk over .. and view the text of the agreement" ~ as we have done ~ you neglected to mention that we are prohibited by law from discussing the specifics of that text with the public…. " As the late George Carlin once correctly exclaimed regarding Congress ~ "It's a great big club, and you're not in it " so get used to it because Corporations are people and the electorate are most definitely not to be trusted with the truth, starting with 9/11 and extending to Drone assassinations and TPP. Elizabeth Warren and Sherrod Brown are absolutely right. The TPP will radically reshape our laws, our economy, and our democracy in favor of the rich and big corporations. Senators Warren and Brown are fighting back on behalf of the American people and they need our support ASAP. Are you with them? 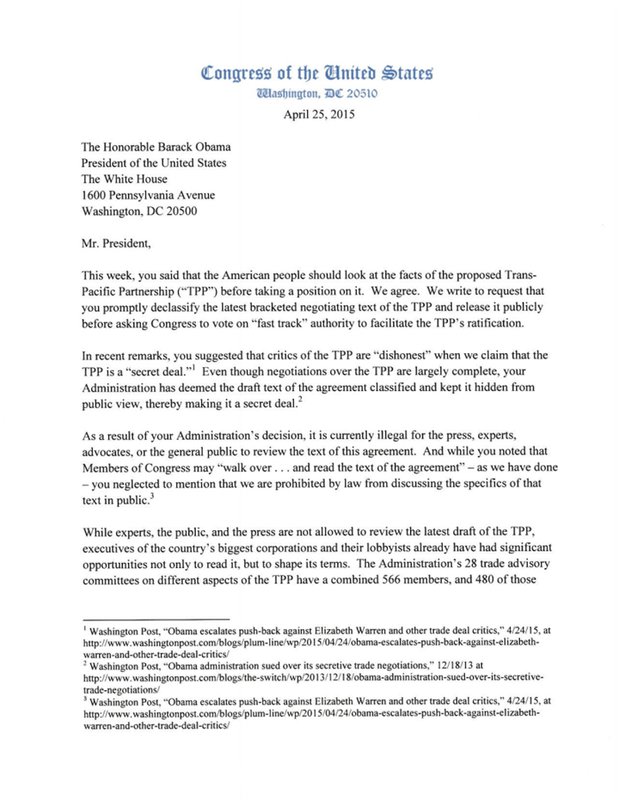 Stand with Elizabeth Warren and Sherrod Brown: Add your name and tell President Obama to release the full text of the TPP. So TPP in reality is really an anagram of the Bush and Obama's administration's attitude toward the electorate of this rapidly fading Republic ~ Tough Patooties, People ! It's a new World Order, folks and guess what ~ we're not in it.
."It's all about tying the hands of democratically elected governments, and shunting authority over to the nonelected for the benefit of multinational corporations," Alan Grayson said. "It's an assault on democratic government."